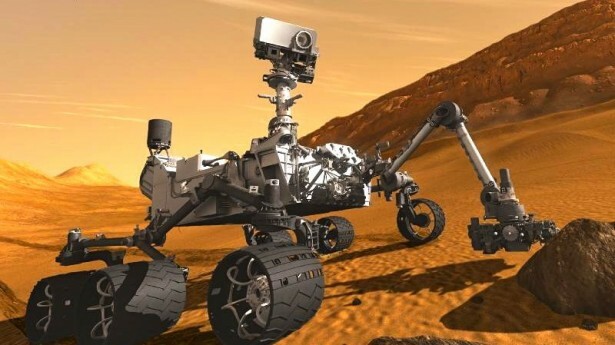 With the successful landing of the Curiosity Rover on Mars this past Monday, the search is on. That is, the search is on to find traces in the Martian soil of organic compounds or of liquid or frozen water so minuscule as to be insignificant even next to the musical talent of the "rock" group ABBA, the discovery of which might indicate that aons ago Mars supported some form of very primitive life. "Only guy on the late shift again!" NASA scientist Fred Bowers moaned last night as he examined the latest data sent to Earth from the Curiosity Rover. "Here I am scooping, sifting, testing ... I feel like a judge at the Pillsbury bake-off!" "C'mon, Fred, get it together, there's too much to do! Say, who are those two guys who just came onto the screen? Funny, the monitor's color must be off kilter, they look sort of green." "Greetings, People of Earth! I am Xanthan Gum and this is Karra Geenan." "Hey, fellas, Fred Barrows. Where'd you come from?" "We live here on Mars, where our highly technologically advanced civilization has built a utopia which we have dedicated to peace, love, justice, and science." "Care to see our nearby gleaming futuristic city?" "No, thank you, I'm kinda busy here." "Well, the spacecraft you're standing next to is known as the Curiosity Rover, and its purpose is to look for trace elements of frozen or liquid water or compounds like carbon." "Sounds like a waste of time." "No, no. You see, if we could determine that there once existed .... umm .... I'm not sure how to explain this, it's kind of technical ...."
"No matter, Fred. We could help you dig with our solar powered soil-moving machines. We use them to tunnel hundreds of miles underneath Mars to locate the minerals that give us eternal life, as well as giant penises for all the men." "Nice of you two, but I've got everything I need here on Curiosity." "Fred, we could share the minerals with the people of Earth. No charge." "I don't mean to be impolite, fellas, but I've got a desk full of work here." "We'll leave you to your primitive devices then." "Say, just out of curiosity --- no pun intended --- how do you guys speak English?" "We monitor your radio and television broadcasts, of course. Mars loves that King of all Media! But why does anyone listen to ABBA?" "Nobody really knows. Bye now." "Damned nice guys," thought Fred Barrows, as he turned back to the myriad computations he had to run on the latest excavated square centimeter of Martian soil. "Wish I had more time to talk. If Curiosity doesn't get me anywhere today, maybe I'll stick 'em in a footnote in my report."